Comments on "Design structure of the euro sets"
Nice compilation and poll, <k>! Since we have eight different denominations, I prefer eight different designs. However, since we have the three "types" (reddish, yellowish, bimetallic), one design per type is fine with me too. Using only one is just boring in my opinion. But, I noticed that you need new glasses. Estonia uses two or even three different designs. There's incused vs raised, and I think (would have to look that up) that the €2 coin shows an extra island. Parent topic: Design structure of the euro sets. Re: Comments on "Design structure of the euro sets"
By the way, Latvia originally planned four designs. 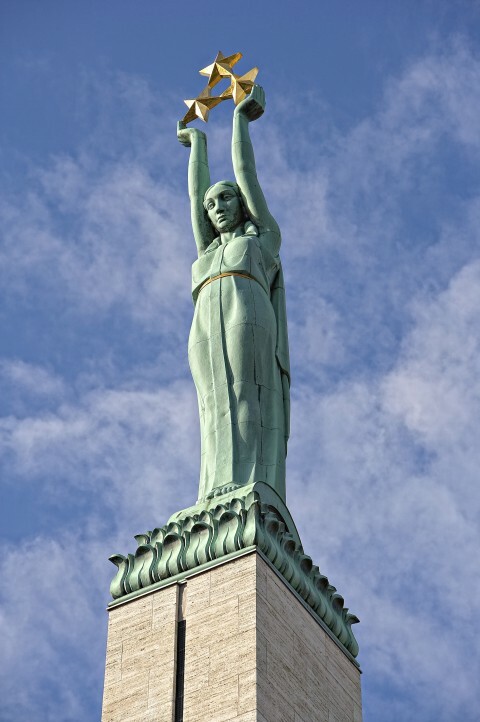 The €2 coin would have shown the Freedom Monument in Riga. Problem was that the lady holds three stars up, and the designer wanted to replace the twelve o'clock star of the European Flag with a (bigger) monument star. Moving the depicted part of the statue "into" the pill would have been possible, but would also have made it difficult to recognize the monument - too "vertical", too small. So the Latvian government decided to use "Milda" for both the €1 and €2 coins. Nice compilation and poll, <k>! Glad you like it. Surely it was about time somebody did it. Unfortunately it had to be me, but I don't even like the euro. I hope you will nominate me for the 2018 Nobel Prize for Selfless Behaviour. But, I noticed that you need new glasses. Estonia uses two or even three different designs. There's incused vs raised, and I think (would have to look that up) that the €2 coin shows an extra island. I'd never heard of this incuse excuse. At first glance, one would never notice the difference - even less so than with the UK 1981 and 1982 five pence reverse designs. I had to think up a way to portray the structure that was meaningful and easy to read and understand. Possibly I should have referred to the coin designs as "w x y z" instead of "a b c d", since I was already talking about Types 1a, 2a, etc. And then there were Tiers 1, 2, 3 - in addition to types 1, 2, 3 , 4. But it seems you understood my scheme without any problem, and the way in which I arranged and constructed the different structure types. I regarded them as sufficiently different designs to be 3 types. But some of us will cut the categories in different ways, according to our own lights. By the way, Latvia originally planned four designs. I well remembered that, as I was writing the topic. And a very interesting topic indeed! Thanks, quaziright. I did have that one to begin with, but then I got things in the wrong order and split the topic to order it. I meant to copy that set back, but I evidently forgot. My plan now is to split off the comments here into a linked topic, so that I can put the main topic into good order. So, that's done. I've spent a good few minutes putting this right. If only I'd been more efficient in the first place. (But then I was very tired today). I'm intent on replacing myself with a robot in the near future. All the voters but one chose the Type 4 set as their preferred option: "a different national design for each coin - eight designs in total". As Figleaf remarked elsewhere, few of the euro zone countries had Type 4 pre-euro set - the same design was in some cases repeated across more than one denomination. We WoC members should now lead a 3000 man march to the European parliament and demand that all euro zone countries should adopt a Type 4 set within two years. The people have spoken, and now our voice must be heard. See also: Euro design structure: overview of linked topics. My 'Designs' page shows the different types in the second-last 'format' column.